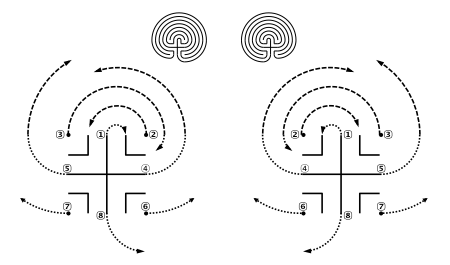 It is easy to draw a classical labyrinth, as its structure is very orderly. You don’t need a pair of compasses or a yardstick, you can draw it freehand. So you can do it indoors or outdoors, whenever you like: on a piece of paper with a pen, on the street with chalk, on a sandy location with a stick or rake; or you could stick gaffer tape on a stone floor, threads of wool on a carpet, there are endless possibilities. The base of the labyrinth pattern is the so-called seed pattern: It consists of a cross, four L-shaped lines and four dots, as you can see. There are sixteen connecting points; both end points of the six lines plus the four dots. The distance between the lines will be the width of the path. This pattern is the base for a classical labyrinth with seven circuits. The next steps are basically simple, but need your concentration, or you might skip a connection. Firstly draw from the top of the cross an arc to the right or the left, connecting the top with one of the L-shaped lines. Then connect, with similar arcs, the left and right adjacent points. Difficult to describe, easy to see. I have numbered the eight steps, and drawn the lines only partly to keep the overview. Depending on your choice to draw the first arc from the top of the cross to the left L or the right L determines whether you get the right or the left variation of the pattern. 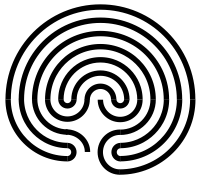 Depending on the size of your labyrinth, you can follow the path to the centre with a finger or your feet. If everything went well, you will not get stuck. Many people consider the exercise relaxing, even while walking with only one finger. 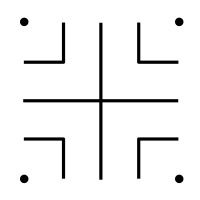 If you are curious, you can experiment what happens if you leave out the four L-shaped lines, or only two, or add another four between the dots and the original ones. Just remember not to leave out the four dots on the four ‘edges’ of the seed pattern. The resulting labyrinths will have more or fewer circuits and sometimes unexpected properties. You can also draw the path, instead of the pattern of the “walls“. It can be done freehand too, but it takes a bit more practice to get it right and orderly. I prefer to mark the centre in some way before I start, in order to have a reference point for drawing the arcs around.